My name is Adam Khafif and I am 21 years old from MA. I recently graduated from Babson College. 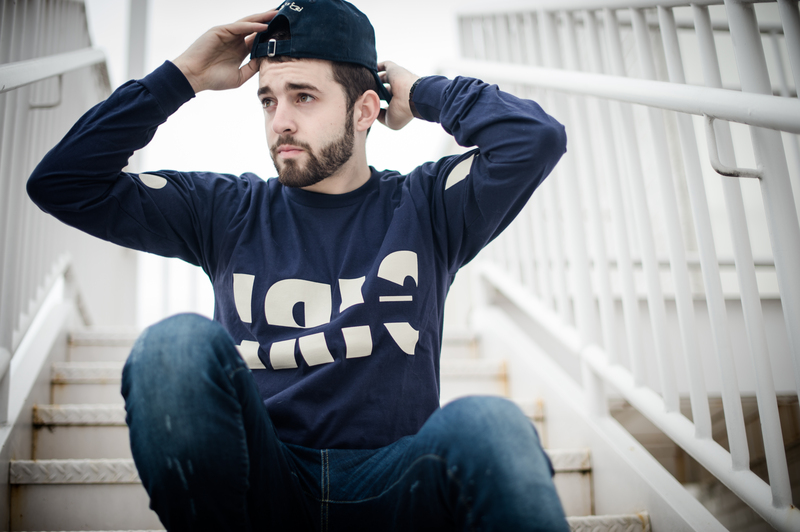 I started Lis’n Up Clothing when I was 15 years old in high school. Growing up, I played just about every sport and I love listening to music. It is also very extremely essential to note that my favorite show is Seinfeld and my favorite cartoon of ALL TIME is Rocket Power. What ignited the spark to launch a business, and what inspired you to choose designing clothes? My parents are entrepreneurs, starting a successful cookie manufacturing business when I was 10. Growing up, I was immersed in business and knew the ins and outs of the daily activities pretty well. I knew that being my own boss was something I wanted to make happen. I also knew that it wasn’t easy and it meant sacrificing time and sleepless nights/mornings. I am extremely competitive, so I knew I was up for the challenge. When I was in high school I’d paid close attention to a few clothing brands I liked to follow. I love companies that put extra attention to detail and offer the customer a complete experience—brands that go the extra mile for their supporters. So when a friend of mine pushed me to start a line of my own, I knew that I wanted to incorporate those same aspects into whatever my future brand was going to be. What is unique about Lis’n Up Clothing? LSNP takes a few concepts and bundles them into a clothing line. The brand is centered around the themes of music. Each release or collection of designs is called an album, and each individual piece is called a track, similar to how musicians release their music. 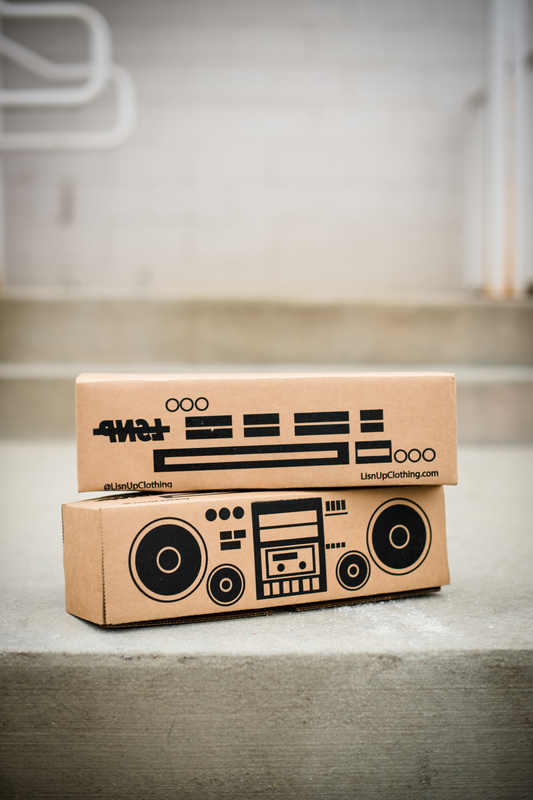 Our apparel even comes packaged in a boom box-shaped packaging, which is a nice surprise when it’s shipped to your doorstep. Your purchase doesn’t end at checkout though. In addition to receiving an awesome box and product, 50% of our profit is donated to a charity of your choice. This ensures that you’re giving to a cause that is meaningful or relevant to you, and that each purchase means something. The aim is to create a unique experience for the customer, one that they will be sure to tell their friends and family about. Not only do we release our own designs, we frequently collaborate with influencers in the community and people I am personally inspired by. We work with athletes, musicians and journalists on specific designs in which the charity portion is donated to a specific cause. 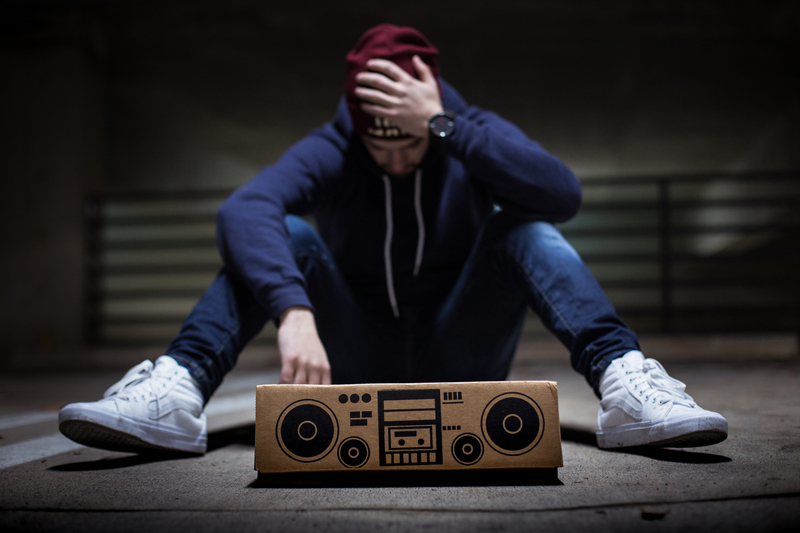 How did you gain the idea to collaborate with recording artists and other creatives, and to give 50% of the profits to a charity of their choice? The first two collaborations, NFL brothers Hamza and Husain Abdullah and Olympic Athlete Ibtihaj Muhammad, came about by request. I’d started the brand by going around to conventions in CA, DC, CT, and Toronto, renting a table and selling there for a weekend. It was at those conventions we met the Abdullah brothers and Ibtihaj Muhammad. One thing led to another, and both parties were really excited to work on something special to benefit the community. These collaborations helped us gain a lot of recognition and clout not only because of the name behind them, but because of the causes, the designs and the quality. We then reached out to Lupe Fiasco randomly on Twitter during Ramadan and he tweeted back, agreeing to work with us. Together, we worked on a Ramadan collection three years in a row. Through all of this madness I met Noor Tagouri. We’d stayed in touch and a couple years later, proposed a line and it took off. Collaborations are like a puzzle. Not everyone who reaches out is going to be a good fit. And I want to make sure the work I am putting out pushes me; this is why I like to work with people who I am personally inspired by. If they’re reaching out or entertaining the idea, then they’ve seen the work we do at LSNP and they have respect for the time we put in. Do you have a favorite collaboration that you’ve done? Is there a collaboration that you want to see happen? Each collaboration is really special in its own regard. The Abdullah brothers hold a special place because football has always been my favorite sport, and that was my first project with an influencer. Our work with Ibtihaj was also amazing! We did two different designs and sold out multiple times. We released certain projects in multiple color-ways because we were selling so many of them. That was our first women’s empowerment collection. I still cheese over the Lupe Fiasco one because Lupe was always one of my favorite rappers. It was so random how everything happened and snowballed—it was incredible! Our collection with Noor Tagouri is something totally different because of how much time it took to release. It is easily the most time consuming project I’ve ever worked on, and the hardest I’ve ever worked on a collaboration. It’s also the first time we released custom, numbered jackets and the first time we’ve gone on tour hosting pop up shops. As for my dream collaborations, they include Yuna, Mac Miller, Logic, Kid Cudi, Wale and President Obama. Most recently, your company had teamed up with Noor Tagouri and created The Noor Effect. How did that come to fruition? I met Noor at a convention where I was selling LSNP at in D.C. She visited my table and was already wearing our Lupe Fiasco collaboration. We both had heard of each other’s work and stayed in touch on and off over the years. This winter I asked her if she wanted to work on something, and it was perfect timing for both of us. She had just finished her first major project and I was on winter break from school so we both had enough time to dedicate to making it perfect. What has been the most satisfying moment during the collaboration with Noor Tagouri? This is a good one! Every part has been so surreal; from the response to the initial launch of the line, to the countless Snapchats we receive of people in the gear, to all the heartwarming messages and comments people have left. It’s been an incredible experience. I’d say the best part is receiving invites from venues to host pop up shops in different parts of the country, and having to choose where to take the tour. But I’ll definitely never forget when Johnny Cupcakes offered to host us at his store on Newbury Street in Boston. Johnny has always been my favorite brand; his ideas, his attention to detail and the experience he’s given his fans is incredible. I used to collect his shirts and his packaging when I was in high school and I practically studied his brand when I was starting my own. So having our last stop for The GIRL Tour at his store is wild. The Noor Effect line will be stopping this June. Due to its popularity, do you guys have any plans to pick it back up? We’ve talked about how often we want to collaborate and what ideas we have for next time. We definitely both agree that this project lasted a lot longer than expected, and that next time we’ll set a schedule and stick to a template. The opportunities just kept presenting themselves so the collaboration snowballed into what it is now before we knew it. But yes, I think we definitely want to work on something again together. But in the meantime, we’ll do our own projects so that when we join forces again, it’ll be even crazier! What is your most and least favorite aspect of being an entrepreneur? What’s a common misconception about entrepreneurship? That you can just put your product in the hands of someone famous and you’ll be successful. Without consistency, you’re nothing. That you’re rich; it takes money to make money. That you can just plop a product on a website and start generating sales. The work and marketing you put into a piece is so underrated. You have to be willing to put so much time into it. Everyone says that, but I think people still underestimate how much time actually goes into something like that. It really varies depending on what needs to be done. I do all the printing, all the finances, all the packing and shipping, all the ordering from suppliers; so depending on sales, each day is different. Some days, I’ll just spend organizing everything in the business or cleaning the studio. Some nights, I’ll spend printing boxes or printing shirts. Some days, I only design all day. Today, for example, I went to the studio (which we call “The Sanctuary”), responded to emails, organized files, did paperwork/finances, packed orders and went to the post office. The minute I left the post office, I got a bunch of orders because we were featured on UpWorthy, so I went back to the studio to pack more orders and went back to the post office. When I came home, I did more busy work on the computer like preparing for our next pop up shop, responding to customer emails and creating an email blast. What are your hobbies? How do you spend your time when you’re not working? I love playing sports and being active. Every Friday after prayer, a group of us goes to the outdoor courts next to the mosque and play basketball for four or five hours at a time. I love going to the movies with my really close friends or just going to one of their houses and to do absolutely nothing; sometimes we’ll play Cards Against Humanity. With the work being put into this collection, doing nothing sounds more and more fun. Given the chance to start your business again, what would you do differently, if anything? I would probably change the name and never have used the logo we had. I would also have not released certain designs that we did. I was really young, so putting out content was exciting to me regardless of how awful some of the first designs were. I also would have taken my father’s advice and not ordered such a large quantity for my first order. Do you have any advice to anyone reading who is inspired to start their own business? You’re going to underestimate the time required to make it work, or if you’re not willing to put that time in. You need to be ready to sacrifice certain luxuries like SLEEP, going out, or spending money. If you truly believe in something, you’ll have no problem doing that. You don’t believe in your work. People can tell, and people don’t want to buy into something that its creator doesn’t have faith in. What are your plans for the future for LSNP? I’d love to work on designs with more influencers like the ones I’d previously mentioned and set up a structure to it. Ideally, I’d like to work with a cause that they’re affiliated with, release it online, and do one pop up shop in a location where most of their audience is. Also, I want to have the line sold in small, respected boutiques. My long-term goal is to open a small shop or boutique of my own with an awesome concept. You can check out LSNP and The Noor Effect at lisnupclothing.com. This entry was posted in Spotlight and tagged FridayFunday, interviews, LSNP, spotlight by murjanian. Bookmark the permalink.